Tag Archives for " The Referral Engine "
6	The Best Lead and Referral Generation Tool Is . . . I suspect I’ve uttered the sentiment in the image below several thousand times over the past few years. It sounds so simple, but it isn’t always easy. The greatest way to generate more referrals is to be more referable. The greatest way to generate more leads is to give your customers something to talk about. The greatest way to build a business is focus more energy on conversion and fulfillment than you do on creating awareness. Few things sell better than teaching. Make it not only part of your marketing, make it part of your culture. Teach your people, teach your customers, teach your industry. When you become a education resource to your entire community you’ll become the company of obvious choice. When you get a new customer teach them how everything works, who in your organization they’ll want to know and how to get more out of what you’ve agreed upon. Tell them what you’re working on for them, how their order is doing, when it will ship, why it will be late, when they can expect to get a new model and pretty much anything you can think of at least two or three times. Plan to surprise your customers in a good way. Few things get people talking more than a fun surprise. And the good news is we do it so infrequently that it’s just not that hard to do. Find someone in your organization, you know the one, and give them huge leeway in terms of creatively surprising your customers. Throw something in that they didn’t order, let them have samples from your strategic partners, ship early, ship free, do more than you said you would. Doing what you promised might actually exceed some people’s expectation, but it’s funny how complacent our customers can become when we merely do what was expected. Shake it up on purpose. Are you measuring the results your customers are actually getting? Make it a point, no a process, to go back to every client and get some form of measurement. Are they thrilled, get a testimonial. Are they so-so, figure out how to improve. Are they unhappy, fix it! Any of these results are better than simply wondering or hoping. Today, go order some simple thank you cards and start writing thank you notes to everyone that’s helping you build your dream into an empire. I’ve just released a new free eBook that delves deeper into this topic and the subject of trust and referral building. It’s called How to Build a Referral Engine, it’s free and I invite you to check it out here. Thursday is guest post day here at Duct Tape Marketing and today’s guest is from Don Campbell – Enjoy! What if – instead of relying on expensive paid ad campaigns and direct sales, your business thrived on referrals from happy customers? 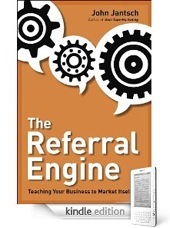 That’s the promise of a book I read a few months ago that profoundly changed my business – The Referral Engine. 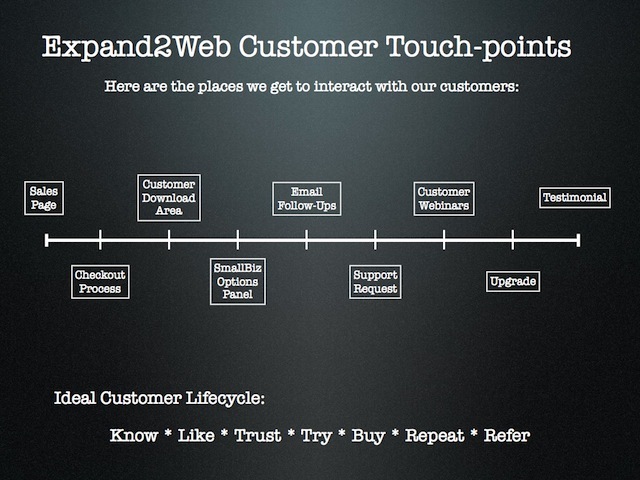 Customer service has always been important for my company Expand2Web. But reading this book made me realize something very important. Although we were getting referrals from our customers naturally, we weren’t really leveraging our heavy – and expensive – investment in customer service. We weren’t setting expectations about referrals early in the sales process, we weren’t making it easy for people to refer us to others, and we weren’t ASKING for referrals, even though most of our customers are happy to give them! The Referral Engine gave us a structure to leverage that investment in customer service and provide more value to our customers at the same time. Following one of the exercises in the book, we mapped out every customer interaction to see how we could offer a truly exceptional experience, and build it in a way that customer referrals would flow naturally. As you can see from the map above, there are many ways we interact with our customers. Even more than we realized at first. When you think about it, you start interacting with potential customer the first time they experience your brand, or land on your website. These interactions continue into pre-sales questions, the purchase process, support, and even beyond. 1) We started setting expectations with potential customers early. Before a customer even buys our product, we started setting expectations that we would ask them for a referral (when we deliver on our promise). On the sales pages and other pages about our products, we explain that our mission is to make them so happy and successful they will want to tell their friends and co-workers about us. This has the dual purpose of setting expectations that we are committed to their success and happiness, and that we will ask them for a referral once we’ve delivered on that promise. 2) We created a “Customer Welcome Kit” that welcomes every new customer, and helps them succeed. Another excellent suggestion from the book was to create a customer welcome kit. We followed this advice and created a customer download area so that each customer could log in and get 24/7 access to the latest version of our software, our support, and step-by-step training guides. 3) We added some unexpected bonuses for our customers in the customer welcome area. For example, we found that the biggest issue for many of our small business customers was learning how to do things in WordPress. So we licensed a series of 20 short WordPress tutorial videos and included them free to our customers. We are also experimenting with other “surprises” for our customers, like written thank you notes and gifts, and other fun ways to let them know we care about them and their success. 4) We now ASK for referrals at key points in the customer relationship, and make it safe and easy for customers to refer us to their friends and family. We’re learning the crucial points to ask for referrals, and how to do that in a way that our customers feel safe and want to refer us. For example, in the book, John points out that there are key times in your customer interactions that are best for asking for referrals. Strangely, right after a support request is one of them. That wasn’t obvious to me at first. Now we’re working on ways to politely ask for referrals from our customers in a risk free way, and to make it easy for them. An improved customer experience. Our new customer checkout experience and welcome kit has led to more happy customers, and lots of nice comments from them. A better product. By reaching out to customers in this way, we get better feedback that goes right back into making our product better. We’ve had several new releases based on insights and feedback from customers, and have another one coming out shortly that has some fantastic new capabilities driven by customer feedback. Better relationships. Not being a natural salesperson, it was hard for me to ASK customers for a referral. 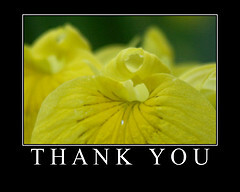 But asking for their help has led to deeper relationships with many customers that I never would have had before. It turns out many people welcome the discussion, and are very willing to help. They feel more vested in what we do and want us to succeed! Increased referrals. All of this has already increased sales for us in a significant way. I can see how continuing to improve and refine this process will lead to even more sales and help our customers get more value from our products and training. Our mission now is to continue improving this process by creating an ever more compelling customer experience, from pre-sales through support, and making it easier for our customers to refer us to their family and friends. Whenever we have to make a decision on where to spend our marketing dollars, this takes precedence. Referrals are now the primary marketing vehicle for us, and best way to grow our business. 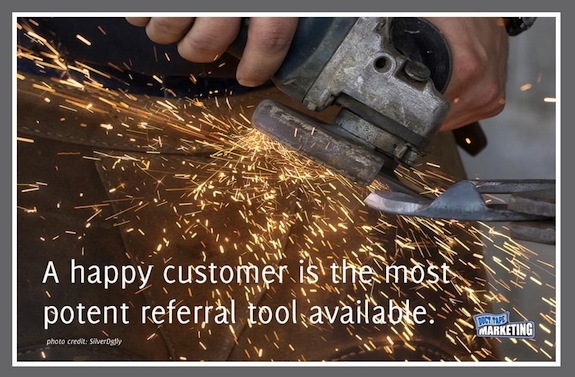 What about you – do you have a system for asking your customers for referrals? If so, what has worked for you? If not, what are you waiting for? Don Campbell lives with his family in San Jose California and is President of Expand2Web. His company provides tools and training to help businesses succeed online. 10	Are You Food or Foe? I want to make a very important marketing distinction today, one that could change how you approach leads, using a metaphor common in the animal world. To a hungry animal everything around them is viewed as either food or foe – something that will sustain them and help them survive and grow or something that is a threat to their health and survival. Our prospects and clients are a lot like that hungry animal out in the wild. They need the products and services that we offer in order to grow and meet their goals, but they’ve been trained through experience to view anything and anyone trying to sell them something as the foe. If you’ve ever wondered why your pure sales messages meet with resistance and deflection it’s because to most prospects you look like someone that is out to steal their money, time and attention – something akin to a predator. In order to take advantage of these instincts you must find a way to make what you have to offer look like food. 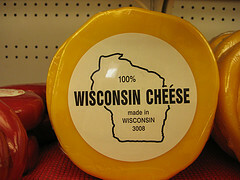 Mind you, I don’t mean this in a deceptive or untruthful way. If you know your products and services provide value, then they are food, but you’ve got to position your message in a way to reveal that or you’ll simply remain a threat. Calling up an accountant and suggesting that you would like to come over and talk about how you could help her clients makes you look like a foe! What if instead you identified an accountant that you knew might be able to help your best clients and that by developing a relationship with that accountant you could make yourself a more valuable resource or “go to” person for all of your client’s needs? Now, what if you reached out to that accountant with the following message – “We believe that we have several clients that could benefit from your services and we would like to learn the best way to introduce you to our clients.” Hmm, do you think they might view that message a little more like food? If said accountant were a mouse, then all the other people trying to grab a piece of their time to get some referrals look a lot like cats and you, on the other hand, look a lot like some tasty cheese. A word of caution is in order here: You can’t use this approach unless a) you really believe that partner is best of class and you would refer them to your best clients and b) you have something to offer that partner that is truly referral worthy. If you short either one of these conditions you’ll soon turn into the worst kind of foe. Using this approach authentically allows you to both end up with the same result by working together, your clients will get more of what they want, you’ll eventually get referrals from your new partner and your new partner will realize the full value of your offerings both to their business and to the benefit of their clients – all because you changed the dynamic in the initial trust building phase. The key is to let a prospect see and experience how they could get what they want first and foremost by engaging in a conversation with you and your products. If you can do that, getting them to buy what you want will simply make perfect sense. This is a powerful mindset change that is highly effective in any targeted lead generating situation you can imagine. So how can you present your offerings as food vs. foe? 2	Want to Get More Referrals? I’ve also posted some ideas on the subject over at American Express OPENForum and thought I would share the entire series with you here? I was in New York last week to participate in the New York Times Small Business Summit and stopped by the Fox Business studios to talk about my latest book – The Referral Engine (Note to self always carry copy of book even though the host is supposed to already have one.) Below is the clip from that interview. I’ve received numerous requests to conduct a free online seminar surrounding the principals and tactics contained on the pages of my new book The Referral Engine. I hope you can join me for the live event, but if you register you can grab the archive a few days after the event as well.